The new Physical Sciences Building at the University of Massachusetts Amherst. The University of Massachusetts Amherst officially opened its new $101 million Physical Sciences Building on Thursday, which would provide students with expanded laboratory space to conduct research and learning opportunities, the university said. “The facility’s expansion will help foster new research and career opportunities, which will help support the STEM workforce pipeline here in Massachusetts,” Governor Charlie Baker, who was among those at the ribbon cutting ceremony Thursday, said in a statement. The 95,000-square-foot brick building officially opened Thursday and features long glass windows, UMass Amherst said in a statement. It incorporates the school’s West Experiment Station, which became structurally unsound by 2015, the university said. The project cost $101.8 million, including $85 million it received from the state, the university said. The new building has offices, specialized laboratories, and about 130 lab benches for the physics and chemistry departments, UMass Amherst said. The labs have an open floor plan, UMass Amherst said, which allows for groups to interact with one another and for lab space to adapt to group size. There are no classrooms in the building, the university said. 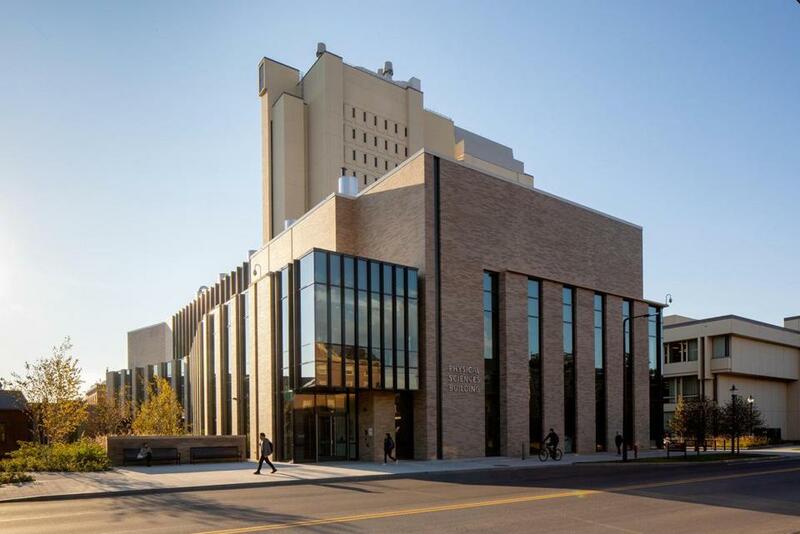 The Physical Sciences Building has “green” features, such as high-efficiency fume hoods and a closed-cycle chilled water loop, and has earned Gold Leadership in Energy and Environmental Design, or LEED, certification, the university said. “This complex is home to the very best facilities in physics and chemistry, enhancing the research capability for our faculty and students in the College of Natural Sciences and providing the STEM talent that is essential for the state’s innovation economy,” university Chancellor Kumble Subbaswamy said in a statement.